The best gift at Christmas? The gift of time, family and love! What a perfect, heart warming book just in time for the Christmas season! It is perfectly sized for little ones hands and comes in a board book format giving it sturdiness for little hands. The images are adorable and bring you back to your own childhood. The book is written in rhymes that allows you to read aloud quite easily to your child with natural pauses. It is the actual story that brought tears to my eyes and which makes this the perfect gift from a parent (or grandparent to a child). It is love and the birth of a child that is celebrated at Christmas. All the other things may be toppings we enjoy but it is love and family that means the most especially at this time of the year. It is a fantastic book to remind not only yourself and child about the true meaning of Christmas but also how much we love our children. This will be one of the best books you could buy a special child in your life this Christmas season! 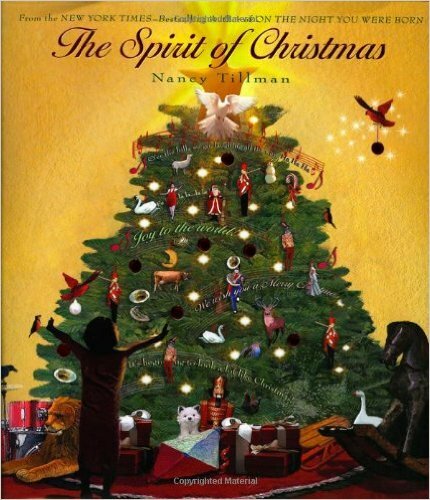 You can purchase a copy of The Spirit of Christmas on Amazon. Nancy Tillman is the author and illustrator of the bestselling picture book On the Night You Were Born ; its companion journal, The Wonder of You: A Book for Celebrating Baby’s First Year ; The Spirit of Christmas ; The Heaven of Animals ; and the New York Times bestsellers, Wherever You Are, My Love Will Find You ; The Crown on Your Head ; and I’d Know You Anywhere, My Love. She also created the mischievous cat Tumford in Tumford the Terrible and Tumford’s Rude Noises, and illustrated It’s Time to Sleep, My Love by Eric Metaxas. Nancy’s mission in creating her books is to convey to children everywhere that “You are loved.” She lives in Portland, Oregon. Disclosure: I received a copy of The Spirit of Christmas in order to facilitate this review. All opinions expressed are my own.